SPRINGFIELD, Mo. 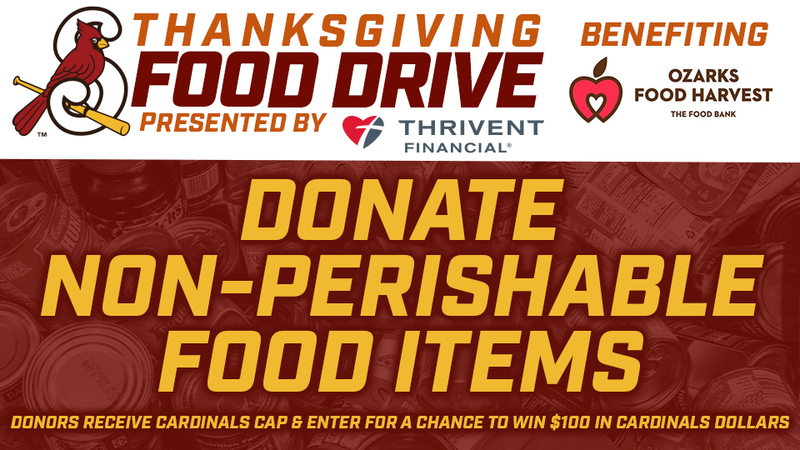 -- The Springfield Cardinals and Thrivent Financial are hosting a Thanksgiving Food Drive, benefiting the Ozarks Food Harvest, beginning Thursday, November 8 at Hammons Field. Cardinals employees will begin collecting donations at the Springfield Cardinals Front Office on weekdays at Hammons Field from 9am-5pm. The drive ends November 20 at noon. Fans who make a donation will receive a free Springfield Cardinals cap and can be entered into a drawing for $100 in Cardinals Dollars. The Cardinals Thanksgiving Food Drive offers fans the opportunity to support the holiday efforts of the Ozarks Food Harvest leading into the 2018-19 winter months. Fans are encouraged to drop off non-perishable and/or canned food items -- including cereal, canned meats/fish, peanut butter, beans/soups/stews, boxed meals/rice/pasta and canned vegetables -- to assist local families in need during the holiday season.